You liked it so much in January, it’s making an early comeback! We hated to miss the fall with this delicious seasonal, so Cody Road Maple will be available starting Labor Day Weekend. 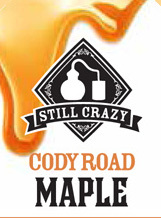 Our delicious Cody Road Bourbon gets an extra kiss of sweetness from real maple syrup harvested right here in Iowa. All of our maple syrup comes from Great River Maple in Garnavillo, Iowa. We also have the Cody Road Bourbon barrel aged maple syrup from Great River Maple for sale in our gift shop. If you haven’t tried it, you need to give it a go. So good and all natural!